Working Solutions is currently interviewing and hiring independent work-from-home Customer Service Agents nationwide (except for New York, Pennsylvania, Washington and California). The company is not new to the “work from home” arena – they’ve been around since 1996 and they have a great reputation. On Glassdoor, the company has been reviewed by 420 people and they rate the company 3.9 out of 5 stars. “Looking to pick up seasonal work hours during and after the holidays or year round—and do it from home? This is seasonal, work-from-home job, you will provide personalized, tax-preparation software support. While we need agents now, the peak times will be from January 26 through April 15. You’ll do inbound phone calls and video chat customer service and technical support, handling technical support questions via phone, with video capability. 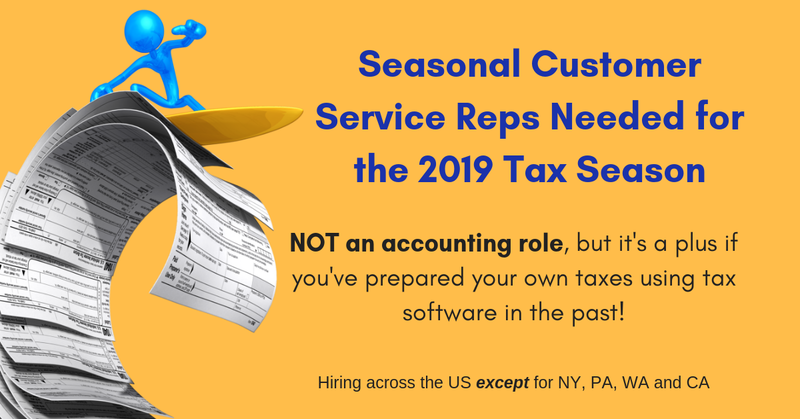 Help customers who are working on tax returns with both product and software inquiries, as well as with tax software questions. Focus on interactions regarding software navigation, plus assist customers with locating prior years’ returns and amendments. Accurately assess customer requests outside of preference scope of work and route to appropriate team for customer resolution. Work from home in a fast-paced, customer-service environment. Click here for full details and to apply. For more jobs like these see our Newest Jobs & Gigs page. To be the first to hear about jobs we post, like our Facebook page. This entry was posted in Customer Service Jobs, Hiring Companies, Independent Contractors, Work at Home Jobs and tagged Working Solutions. Bookmark the permalink.